My new favorite recipe this summer is the Mediterranean Chopped Salad recipe from the Nordstrom Entertaining at Home Cookbook. I have made it as a salad per the recipe and turned it into a Mediterranean Chopped Pasta Salad by substituting a pound of penne pasta for the lettuce when I wanted heartier fare for a wedding shower I hosted. My favorite part of this favorite new recipe is the dijon-balsamic vinaigrette. You will love it, I guarantee. Dijon-Balsamc Vinaigrette: In a food processor, combine the vinegar, onion, mustard, brown sugar, salt and pepper. Process until smooth. With the processor running, slowly add the oil in a steady stream. Taste and adjust the seasoning. 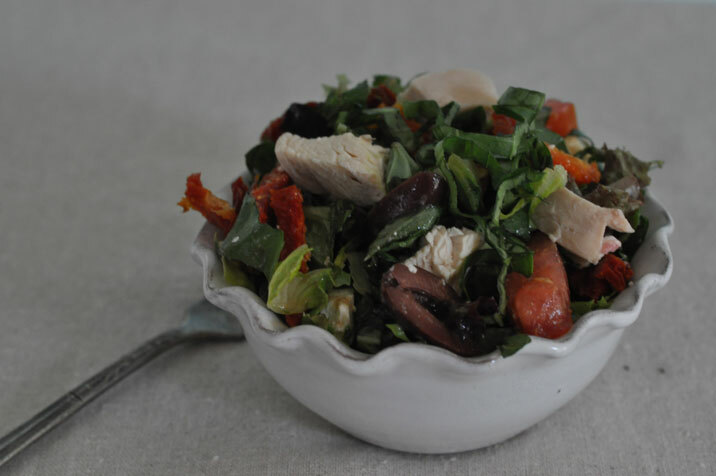 For Salad: In a large bowl, combine the lettuces,most of the feta, chicken, sun-dried tomatoes, tomatoes, olives and basil. Drizzle 1 cup of the vinaigrette over the salad and to coat. Add more dressing as needed. Season as needed with salt and pepper. For Pasta Salad: Substitute cooked al-dente penne pasta for the lettuce. Sprinkle the remaining feta cheese on top of the salad. 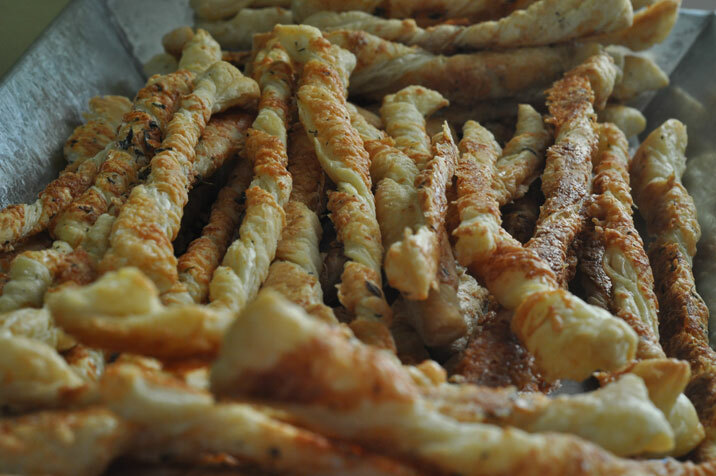 Along with the pasta salad at the shower, I served these very easy to make cheese straws by the queen of entertaining, Ina Garten found in her Barefoot in Paris cookbook. Don’t you just love puff pastry? Roll out each puff pastry until it is 10x12 inches. Beat the egg with 1 T. of water and brush over the surface of the pastry. Sprinkle each sheet evenly with 1/4 cup parmesan, 1/2 cup gruyere, 1/2 t. thyme, 1/2 t. salt and some pepper. With a rolling pin, lightly press the ingredients into the puff pastry. Cut each sheet crosswise with a flour knife or pizza wheel into one inch strips. Twist each strip and lay on parment paper coated baking sheets. Bake at 375 degrees for 10 to 15 minues, until lightly browned and puffed. Turn over and bake another 2 minutes. Cool and serve at room temp.